The SOLARCOM range are advanced full solid-state charge controllers using a true PWM regulation Algorithm. Each controller is rated according to its admissible charging current and operating voltage. 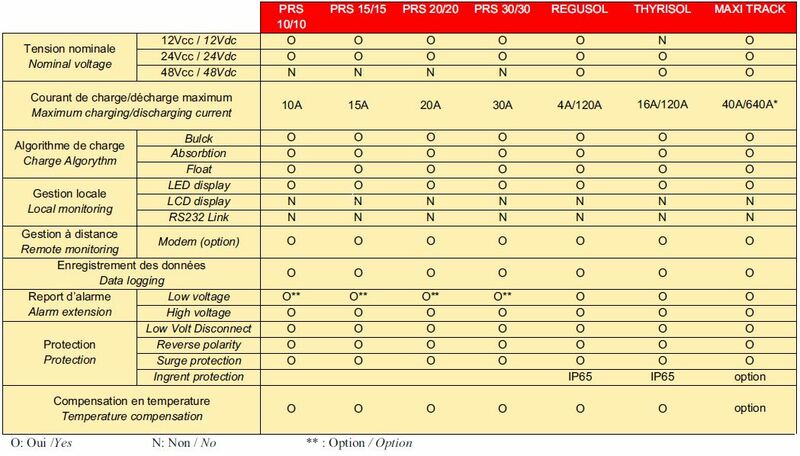 For small PV generators, the PR, PRS models 10/10, 15/15, 20/20, 30/30 – 12/24V are the most advanced PV chargers available today. For medium and high power generator, we recommend the REGUSOL,THYRISOL model or the MAXI TRACK unit as preferred solution. Due to its modular extensions, the MAXI TRACK can handle charge or discharge currents 40 x n number of modules under 24 or 48V. MT 2000 in // up to 16.